Resting on the seventh day doesn’t fit neatly into our busy lives, but Keri Wyatt Kent provides functional advice to help pause and refresh even the busiest life overrun with demanding jobs, countless kids’ activities and getting dinner on the table. 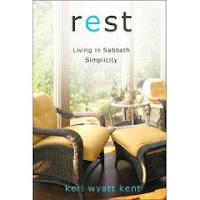 Kent combines her own life experiences as a soccer mom with her study of the ancient practice of resting one day of the week, known as the Sabbath, in her new book Rest: Living in Sabbath Simplicity (Zondervan, January 2009). She invites readers to rediscover the practice of Sabbath in a practical and accessible format. Kent bases her study on Jesus’ teachings and actions and explores six aspects of Christian spiritual practice that lead to Sabbath Simplicity: resting, reconnecting, revising, pausing, playing and praying. Practicing these six actions creates space in our lives for rest and renewal. "Sabbath, first and foremost, is a gift from our loving God. He invites us to take a day to rest from our labor, so that we might engage in relationship with him and with others. Its purpose is to refresh us physically and spiritually, to celebrate our freedom, to draw us close to God, and yet to remind us that we are not God. "God commanded us to Sabbath, to stop. But Sabbath-keeping is also a spiritual practice or discipline. All disciplines, (like prayer, solitude, etc.) create some space for God in our lives. Just as we have a lot of latitude in other practices (we can pray any number of ways, for example), we have freedom in how we practice Sabbath. My book offers a lot of ideas, and real-life examples, of how to approach this life-giving practice. "Sabbath Simplicity is a sanely-paced, God-focused life. It’s a lifestyle that includes the practice of Sabbath-keeping, but goes beyond just taking a day off. In a way, it’s living out what Jesus told us to do in Matthew 6:33: Seek first his kingdom and his righteousness, and all these things will be give n to you as well. Sabbath Simplicity seeks God first." So if you are looking for a take-along book that will touch your spiritual senses, try Rest: Living in Sabbath Simplicity. For more information about Keri Wyatt Kent go to her website.